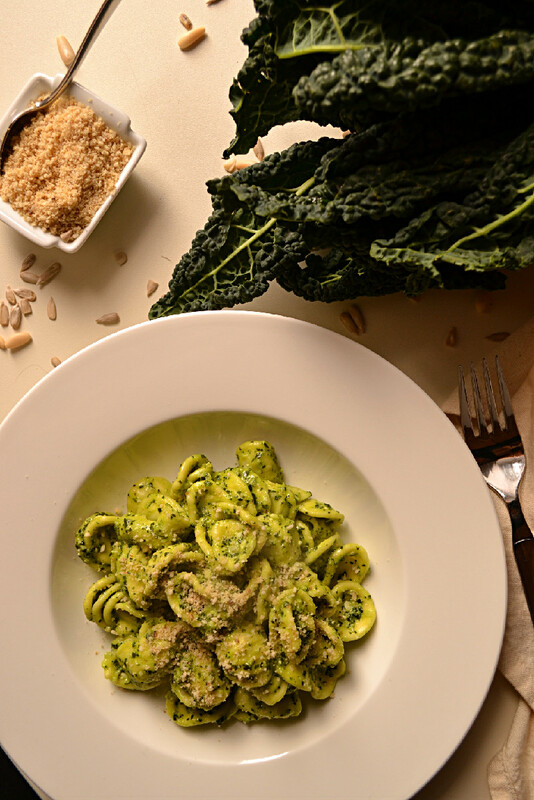 No words could ever describe how I feel about this Tangy Tuscan Kale Pesto. #foodgasm #love #bestpestoever come to mind, but they certainly don’t do it justice, so stop everything you’re doing (after you’ve finished reading this of course) and make it, your taste buds will thank me. I’ve made several kale pestos in the past but none have ever come close to this one. I added some lemon juice to it which is not a traditional pesto ingredient but it sent the taste through the roof and really made all the flavours pop. 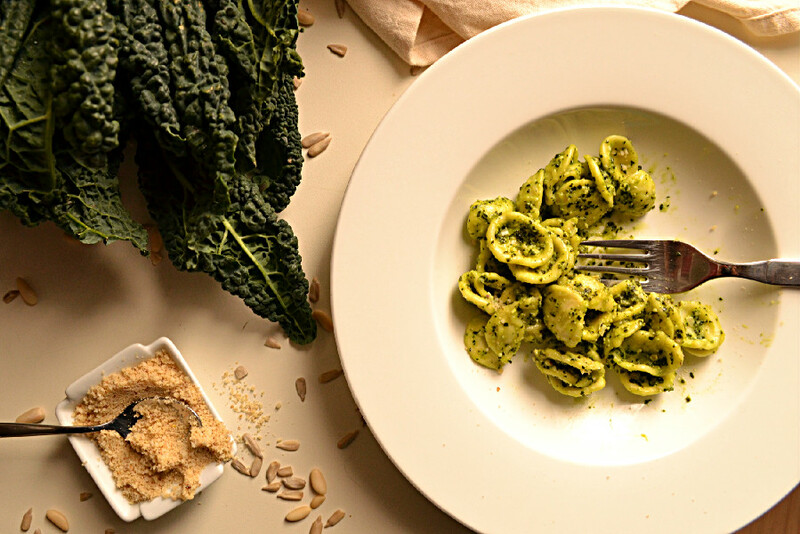 I paired it with orecchiette, meaning “little ears” in Italian, a pasta shaped like tiny little ears, as the name suggests, which traps the pesto nicely. These orecchiette also have a design etched into them, they’re not smooth, so the pesto really clings on. Then I topped it all off with a vegan “parm” I whipped up and OMG – #foodgasm, again. I posted it to Instagram weeks ago and I got almost 300 likes on that post, which is no big deal compared to some bloggers out there but for me it was huge, as it was more than I have followers and the most number of likes I’ve had on a post ever. After that I couldn’t keep it to myself any longer, I had to post it for you to make, enjoy and share with the world, on Instagram, Facebook, Pinterest, Twitter or wherever else you please, just please be sure to tag #harmonyalacarte while you’re at it and don’t forgot to come back here and leave me a note about how it turned out for you. Before I move on to the recipe, I’d like to pay homage to kale. I’ve talked about the benefits of kale over and over again and the celebrity dark leafy green needs no introduction for the well versed plant eater. For the benefit of the less versed about its benefits, this stuff rocks. Its loaded with vitamins and minerals like vitamin C, E and K, the group B complex vitamins, fiber, folate, iron and calcium among many more. I find it rather interesting that ounce per ounce kale has more absorbable calcium than milk, making it a healing food for ailments like osteoporosis, arthritis and joint pain. It can be eaten raw or cooked and used in many preparations, like slaw, grain salads, stir fries, soups, chips and the list goes on. The rich dark green colour also means it’s loaded with natural chlorophyll. Chlorophyll is to plants as hemoglobin is to humans and helps plants convert sunlight to energy and produce a radiant green colour. The benefits of consuming this molecule are numerous. It stimulates cell growth and healing, neutralizes toxins in the blood, helps reinforce the immune system to fight infection, improves liver function and apparently helps eliminate mouth and body odours. You get the drift, eat lots of kale and get lots of chlorophyll. Without further ado, I present you, Tangy Tuscan Kale Pesto and it’s trusty sidekick Walnut “Parm”. Thoroughly wash and chop kale into bite size pieces. Transfer to an airtight container or jar and drizzle additional olive oil over the top to preserve it and prevent it from going bad in the refrigerator until you are ready to use it. If you are using it immediately, you may or may not need the extra tablespoon to olive oil depending on personal preference. Cook pasta in salted boiling water, according to package directions for al dente. Return the pasts to a large pan or wok, add 4 tablespoons of tangy kale pesto and pasta cooking water as required (start with 3 tablespoons and work your way up as needed, one table spoon at a time. The pasta water helps with blending your pesto into your pasta for a smooth and uniform coverage, but you don’t want to add too much and water it down). Transfer to serving dishes, top with vegan walnut parm and serve hot. 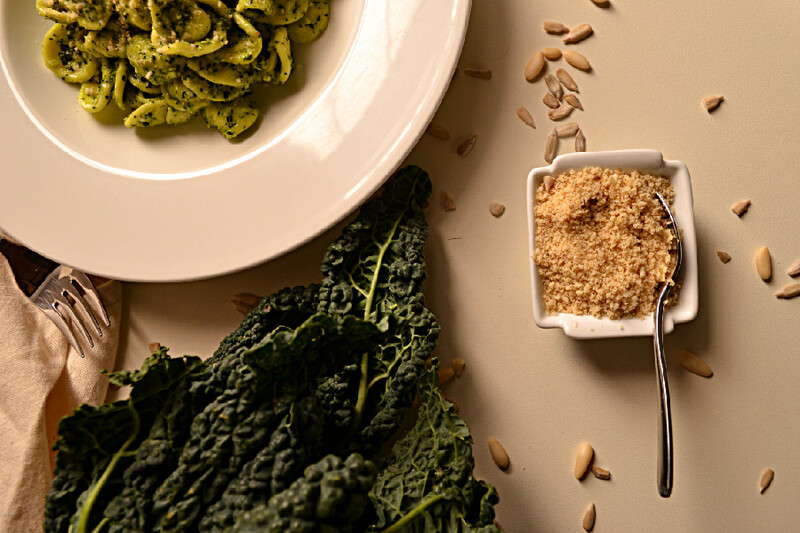 I love kale pesto! Will try your walnut parm! I really like your picture!